I kinda like poetry...not that I'm ever going to a poetry reading. But I'm picky about it. No rhyming, or syllable structure for me. Think free verse and you've hit the nail on the head. I think I like free verse because it savors the words and doesn't force them, kinda like my personal voice inside my head. Aside from reading poetry, I absolutely LOVE writing it. Not necessarily because I get to express my thoughts, but because I write using found poetry. Its a cheater way that forces the mind to take what it has been given and bring new life. 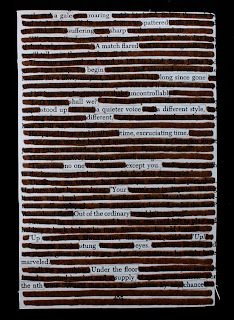 Found Poetry is an exercise in creativity that forces you to think outside of the box. Personally I allow myself to add a few words or change the word-form a bit. (there is plenty of stretching to do with those allowances!) 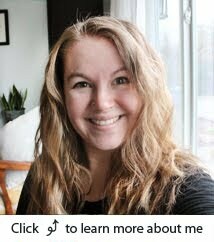 Perhaps you should give it a try because it is tons of fun (nerd alert), and a great way to stretch your creativity. Maybe you won't like the poem you come up with...either the sound, or the subject matter. 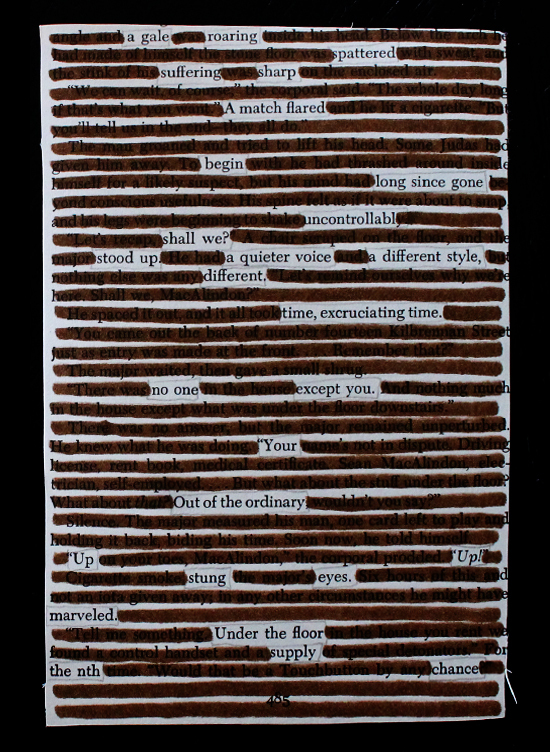 Thats ok. Because it is found poetry, some of what you have is dictated for you, and some is left for you to arrange. Don't like it? Grab a new page and start again. 1. 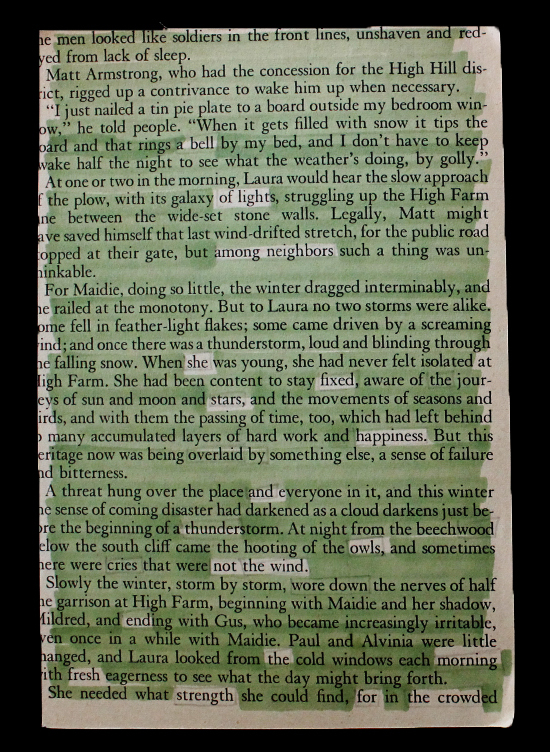 Start with a page torn from a book (I like to use the $0.99 readers digest collections from the thrift store). 2. Skim, DON'T READ, skim the page for words that stand out to you. 3. Circle those words in pencil. 4. 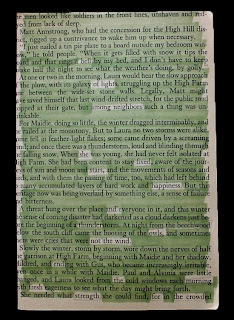 Go back and read all your circled words...if need be search for more words to flesh out your poem a bit more. 6. Boom DONE! Poem formed. Mind sufficiently broadened. Poet in the making. Here are two examples I created this morning. Now lets hear yours! she fixed the night with stars, happiness and thunder. Owls, not the wind ended the darkness. With strength for the crowd. splattering me with sharp suffering as if I were a flaring match. My beginning was long since gone. A quiet voice, a different style-a different voice, spoke. Time, excruciating time went by before He spoke again. "No one except you can do it. You're out of the ordinary." that down on the floor the Lord supplied my nth chance. That sounds pretty interesting. I think I read one that you had done before. I just might try this! Well, what can I say? :) Sometimes that side comes out.